The Neptronic SKV evaporative humidifier series is usually incorporated into an A.H.U after the pre-heating coil and before the cooling coil. 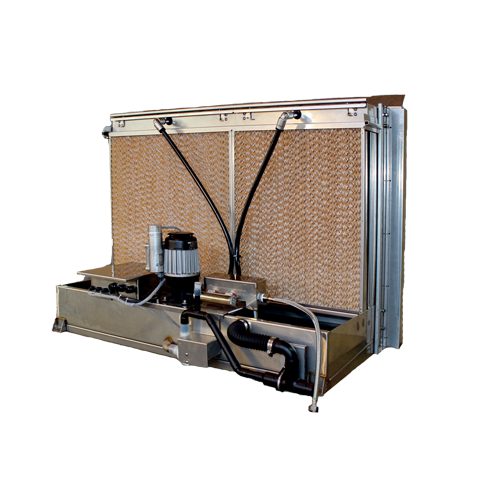 The Neptronic SKV evaporative humidifiers can be easily integrated into an air duct system. Usually the designer must provide a duct section enlargement to ensure the correct air velocity but retrofit is common and easy to incorporate. The humidifiers can be delivered in modules to build any size of “humidification bank” into a large A.H.U for large airflows down to pre-assembled smaller units which make installation straight forward. The controller is located within the humidifier control panel situated upon the outside of the air handling unit: Incorporating automatic timed flushes and drain activation, the control panel ensures water quality. A display shows set points, fault alarms, current humidity as well as status and history, thus making the Neptronic Control panel the most advanced piece of equipment available on today’s market.